Katyayani-vrata is a month-long vow of worshipping the demigoddess Katyayani, a form of Krishna's material, illusory energy. Katyayani is often worshiped for temporary, material gains, but Krishna's cowherd girlfriends, the gopis, worshiped her to have Krishna as their husband. 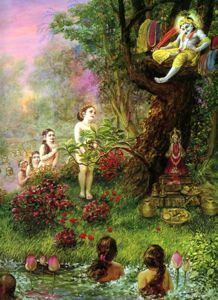 The Srimad-Bhagavatam describes how the gopis followed this vrata in the chapter entitled "Krishna Steals the Garments of the Unmarried Gopi Girls." The image at right depicts the gopis asking Krishna to return their clothes. The deity of goddess Katyayani is in front of the tree in which Krishna is sitting.